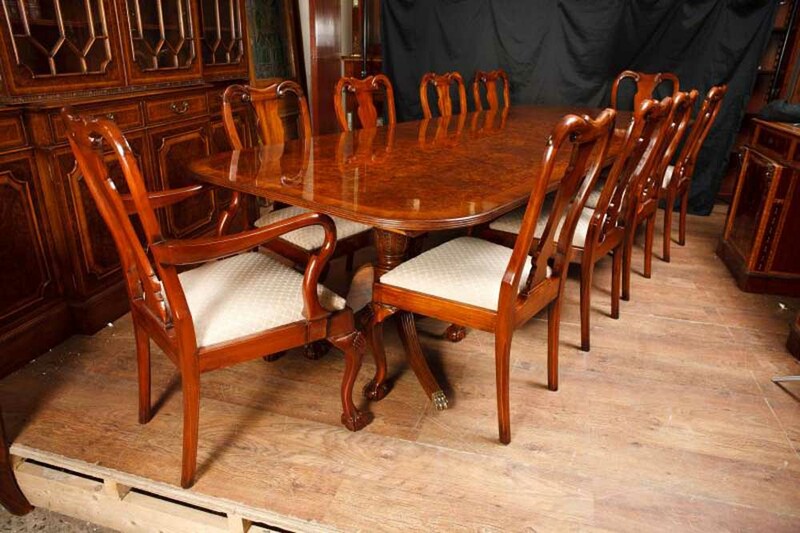 You are viewing a gorgeous English walnut Regency style pedestal table that measures ten feet when fully extended with a set of matching Queen Anne style chairs also in walnut. I hope the photos do this classic set some justice, it’s certainly more impressive in the flesh. 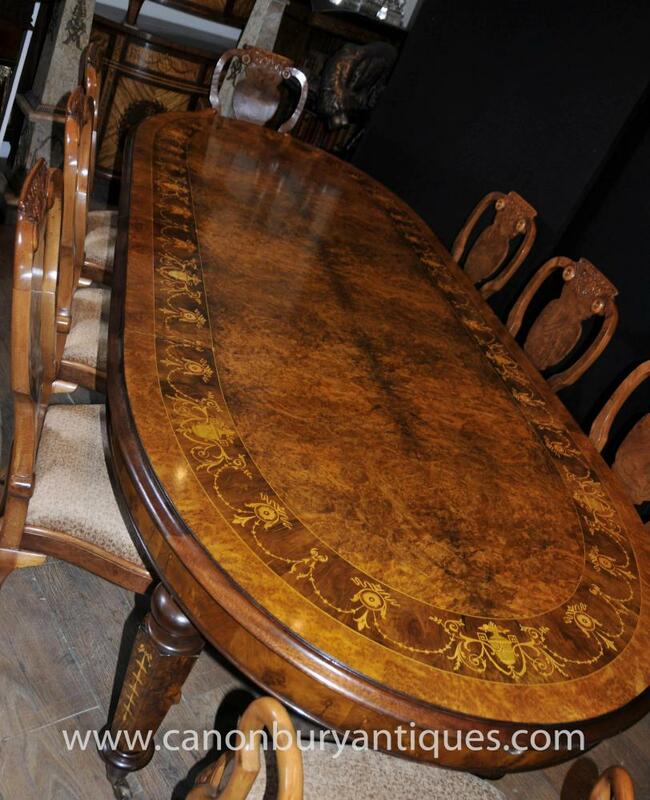 The table comes with two leaves each measuring 24 inches so you there are various different size options – you can even use the two pedestal ends together on their own. It’s great for different functions and sized dinner parties. The veneer to the walnut is superb, all the grains and whorls to the wood are really excellent and of the highest quality. 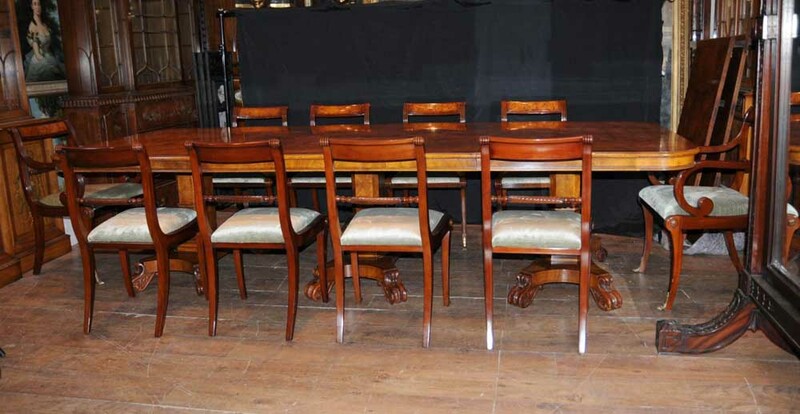 Then of course for the ultimate in dining chairs look no further. I’d like to say they are the king of chairs but that would be incorrect as these are Queen Anne style chairs with the distinctive, solid, wonderful craftmanship as befits this model. Hence, they are the Queen of chairs. You are viewing a set of 10 – consisting of two arm chairs and eight sides. 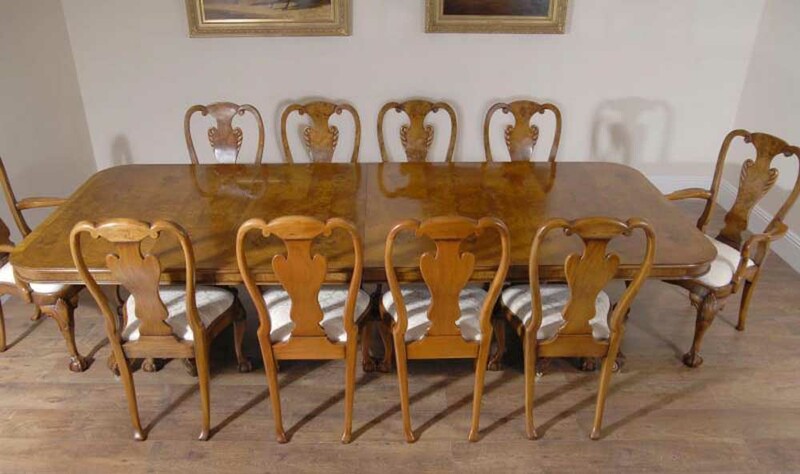 They have a wonderful fluidity and rhythm to these chairs with the cabriole legs with hand carved motifs and the beautiful back spalt with the scrolling emblem. To sit in they are also very comfortable with the re-upholstered white seats to each chair, hence free from any previous owners smells such as smoke and pets, always a bonus. 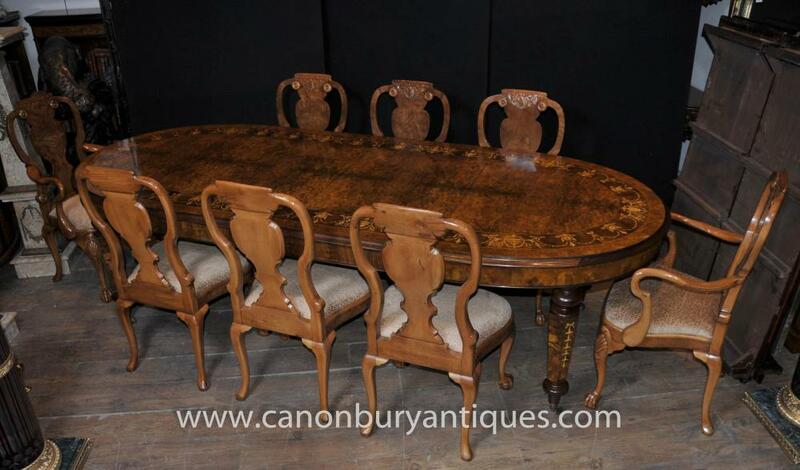 They look fantastic round a dining table. What is more important than eating together, whether with family or friends? Why not do it in total style with this work of art? We appreciate it’s quite an initial investment but this will last for generations making it a great investment and heirloom. 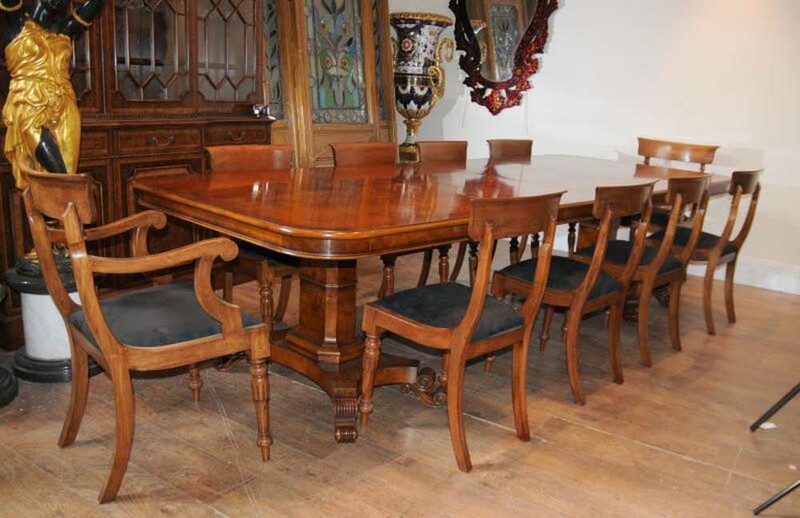 Victorian Dining Tables – we have a range of Victorian dining tables. Many are characterised by the wind up leaf system. You can extend the table by winding the handle at the end of the table which operates the mechanism. 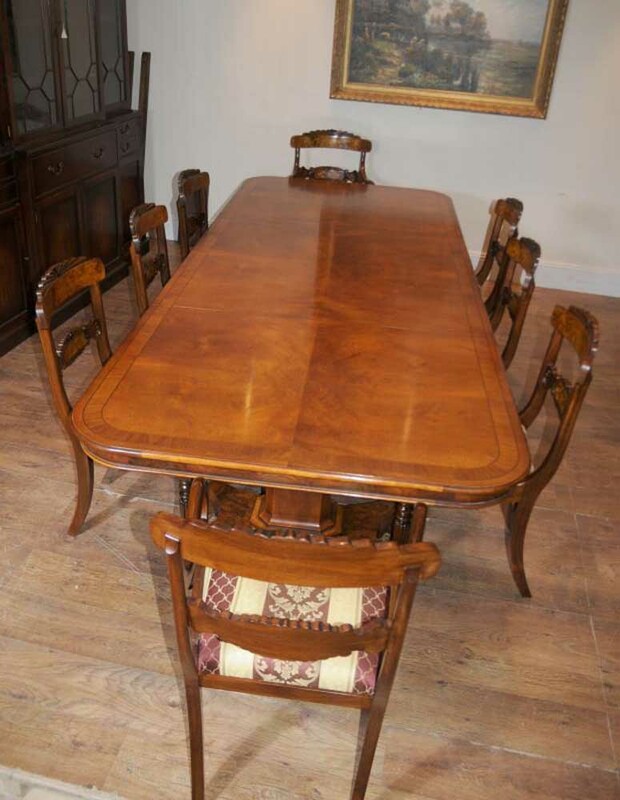 Conversely it can be made smaller to suit different dining set ups and amount of guests. 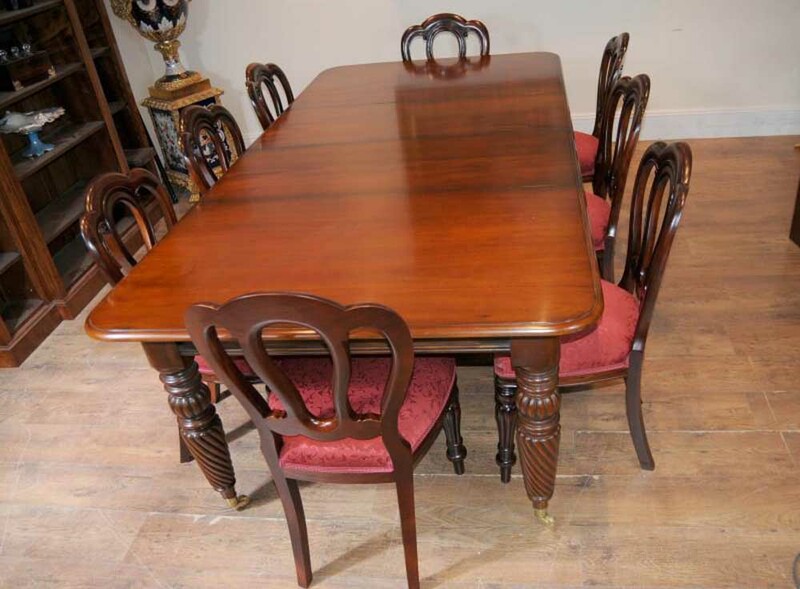 Victorian dining tables come in walnut and mahogany and we have various chairs to match if you are looking for a complete set up. Queen Anne Chairs – Queen Anne chairs are an absolute design classic and the high and wide backsplats make them very comfortable. Also common are cabriole legs with ball and claw feet. 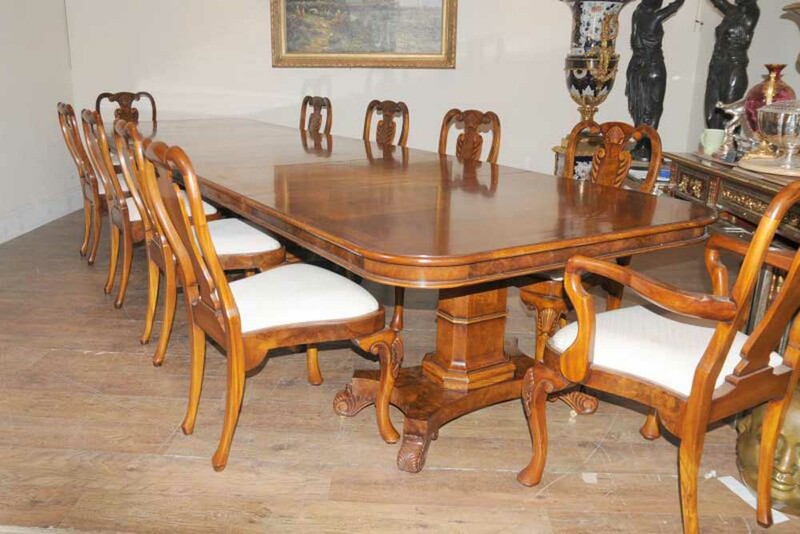 Queen Anne chairs can come in walnut and mahogany and another distinguishing feature are the hand carved shell motifs.